I receive commission for purchases made through links in this post. Sheet pan dinners: they’re everywhere. Because they’re awesome. And I can finally vouch for that since I’ve found a way to put a pescetarian spin on the mostly poultry-friendly concept. I mean no hate; it makes sense. The time it takes to roast chicken breasts aligns quite nicely with the time it takes to crisp up small potatoes and various other veggies. It’s cool, I gotcha. Us pescetarians deserve to have a collection of fuss-free weeknight dinners up our sleeves, too. As someone who is severely offended by dry overcooked fish (YES, SEVERELY), I knew that a pescetarian sheet pan dinner had to be cooked in stages. The concept worked and I high-fived myself all the way to the dinner table. It’s the little things, friends! Tips for roasting garlicky potatoes. I love crisp, garlicky potatoes. You can definitely swap the fresh garlic for a few dashes of garlic salt, but fresh garlic obviously brings a bigger punch. If you’re using fresh garlic, be sure to mince it well and, when you distribute the potatoes onto the pan, be sure to scoop up any garlic on the pan and lay it overtop of the potatoes. Garlic left on the pan will burn, leaving you with bitter flavors and, obviously, bitter dinner guests. Have you ever bit into the chewy woody end of an asparagus spear? Delicious, right? (NO.) Getting rid of those woody ends is crucial, but knowing where they begin and where they end isn’t obvious to the eye. Hold each asparagus spear, one at a time, horizontally between your fingers and thumbs. Give it a quick snap, like you’re snapping a twig. The spear will break where it’s supposed to, ridding you of the woody end with no guesswork involved. 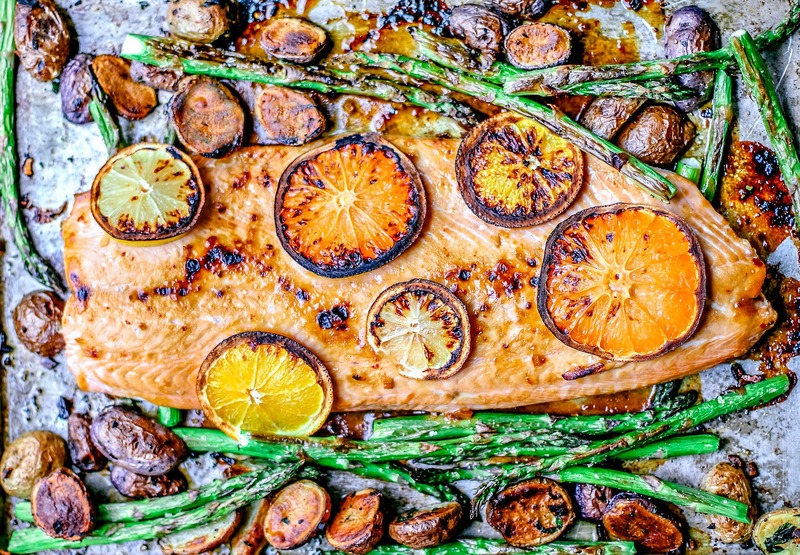 Easy Honey Citrus Sheet Pan Salmon. I really wanted to take advantage of winter’s citrus before it’s gone, so I went all out. I squeezed in some lime, lemon, orange, and even some tart ruby grapefruit because heck, why not. Blended with tamari or soy sauce, honey, coconut sugar, sambal oelek, garlic, and ginger, you get a bit of everything. You can also keep checking back to Orca Direct, because it will be available online soon and, in that case, you get to use my nifty perk code (killingthyme2018) at checkout to get 15% off. Because we’re friends. Keta salmon is a lesser-known species, but it’s one of the *best* values in wild Alaska salmon. It’s mild in flavor and it’s versatile, which makes it an approachable option for those who don’t cook a lot of fish at home. Keta is also a drier fillet in comparison to some other species due to its lower fat content. But! It still offers up a ton of flavor and flakiness, making it a total win. Bonus: leftovers of this salmon is ah-mazing in a salad or a wrap for your next-day lunch, so you can enjoy it without reheating it and stinking up the lunchroom. Flaky salmon is slathered with a finger-licking honey citrus glaze and baked alongside crisped up potatoes and asparagus for an easy weeknight one-pan dinner. 1-2 bunches of asparagus, woody ends broken off See notes. Preheat oven to 400° F. Place the halved potatoes in a large bowl and drizzle with olive oil. Toss to coat. Add the garlic, parsley, salt, and pepper. Toss again to coat. Evenly distribute the potatoes over a baking sheet and set bowl aside for asparagus. With a spoon, scoop up any garlic that has landed on the pan and spoon over potatoes. Any garlic set on the pan will burn and bring on a bitter flavor. Bake the potatoes for 20-30 minutes, or until golden brown, tossing halfway through. Squeeze the lime, lemon, orange, and grapefruit juice into a medium-sized saucepan. Discard any seeds. Add the ingredients from the through to the ginger and whisk until well-combined. Place the saucepan over medium heat and bring to a simmer. Simmer until the mixture thickens, about 10 minutes. Add the butter and stir to melt. If you'd like a thicker consistency (I always do), mix the cold water and corn starch into a small bowl, whisking with a fork until the corn starch has dissolved. Slowly add it to the simmering glaze mixture, stirring constantly until the mixture thickens. Remove from heat and set aside. Break off the woody ends of the asparagus (see notes). Place spears into the bowl your potatoes were in. Drizzle with olive oil and toss. Sprinkle salt and pepper over the spears, and toss again to coat. Set aside. Bring the salmon out and set it on the counter 15 minutes before it's set to go into the oven. Bringing the salmon to room temperature will ensure an even cook. Pat the salmon dry with paper towels and sprinkle with salt. When the potatoes have crisped, bring the pan out of the oven and set it somewhere safe. Move the oven rack about 6 inches from the broiler and set broiler to high. With a spatula move the potatoes to the sides of the pan to make room. Set the salmon down in the middle of the pan. Distribute the asparagus around the sides. Carefully pour half of the glaze mixture over the salmon, brushing it with a basting brush to evenly coat. Set the rest of the glaze aside. Place the pan under the broiler and broil for about 13-15 minutes. Because every broiler is different, keep a close eye on it. It doesn't hurt to check the internal temp of the salmon at 8-10 minutes in, and monitor it closely after that. You're looking for an internal temperature of 145° F.
When done, remove the pan from the oven. Carefully discard the fruit slices. Brush the remaining glaze over the salmon, cut the fillets into 4-6 oz portions, and serve. The amount of asparagus is hard to judge as it depends on the spears available to you. Sometimes they're thick, sometimes they're super thin. Judge as best as you can based on the amount of people you are serving. Not into asparagus? Use green beans or broccoli! Set your salmon out on the counter about 15 minutes prior to cook time to bring it to room temp. This helps in giving you an even cook with your salmon. To get rid of the woody ends on your asparagus, simply hold each spear, one at a time, horizontally between your fingers and your thumbs and bend it until it breaks, as if snapping a stick. The woody end will break off exactly where it should. Have leftover salmon? It's great flaked into a salad or wrap for a next-day lunch! I just made this a few nights ago, and we all thought it was delicious! I doubled the recipe because my fish was 2.8 lbs, but left out the lime and grapefruit juices because I didn't have them. I also left out the coconut sugar (and thought this was still sweet enough with just the honey) and butter (to keep it dairy free). I zested my lemon and orange, adding the zest to the fish after pouring the glaze over it before baking. I broiled the fish and potatoes together (after baking the potatoes by themselves first, per your recipe), but after maybe 10 - 12 minutes my potatoes were getting really brown, so I adjusted the oven rack to the middle of the oven and baked the fish and potatoes another 10 minutes or so until the salmon was 145 degree internally. Perfection! Super delicious! I had to cook the asparagus separately because I didn't have room on my sheet pan. Thank you for the recipe! I will make it again! Maybe next time it will be warm enough to grill the salmon! Just made this for dinner and it was meh. I would do it again with only orange. Combining all the different citrus fruits yielded a muddled and forgettable sauce. Interesting technique though. Hi Fatima! I'm sorry you found this dish to be meh :( I hope going solo with the orange treats you better! What a truly exquisite dish. Just gorgeous! And citrus season is my favorite! Pinning this right now! This looks like the best dinner and I love that there is minimal clean up! omg what a gorgeous and delicious salmon!! I try to eat salmon once a week (sometimes more! ), so I'm always looking for unique recipes like this one. Love it! Insanely gorgeous photography (as usual), and also OMG - this looks delicious. Salmon is that one super healthy food both of my kids will eat, so I'm always looking for new recipes. Pinning and trying soon!